We are slowly coming to the end of this series! To bring it to a close, the next three articles will briefly introduce you to several forms of synthesis that aren't as widespread as the ones described in previous installments. However, I think it's important to mention them, if only to highlight the extraordinary diversity of sound creation possibilities that go under the generic name of sound synthesis. Over the course of this series, I've covered what I feel are the most important synthesis methods (with still more to go), but the process of deciding what to write about is subjective in some ways. If you have something to add to the conversation, or just want to comment on what's been covered, I invite you to participate via the comments section below. We'll start this overview of "weird synthesis" with a particular form of granular synthesis: Pulsar synthesis, as formulated by Curtis Roads. Like granular (and other types of) synthesis, pulsar synthesis is based on very small units, in this case, called "pulsarets." These are made up of a waveform of any type, usually called W, followed by a silent time interval (S). The period P (see article 2) of a pulsaret encompasses these two values. Varying the duration of the sub-period of W, without varying P, allows you to simulate the use of a bandpass filter (see article 7). The overall amplitude can me modulated with an envelope (V). Pulsar synthesis also allows you, among other things, to shift between different traditional tempo values in real time (quarter notes, eighth notes, etc.). Phase distortion synthesis is closely related to frequency modulation synthesis. While the latter was mainly exploited by Yamaha, phase distortion synthesis was developed and used by Casio, who implemented it in its CZ series of synthesizers. PD synthesis is based on wavetables (see article 18). In this case, a sine wave stored in the memory is read using a so-called "phase" function ─ another wave, since a wave is nothing more than a mathematical function. Actually, you could say that phase distortion synthesis is a way to modify the playback speed of a waveform, without altering its overall frequency. Instead of modifying the speed at which cycles run ─ which would entail a variation of the waveform's frequency ─ you are acting on the playback speed within a cycle, without modifying the period of the waveform itself. 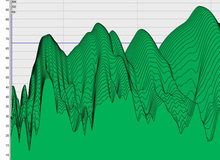 This way, the waveform at the output has the same pitch, but it's not a sine wave anymore. Thus, phase distortion synthesis allows you to simulate a resonant filter very convincingly. The main differences in relation to FM synthesis have to do with the fact that the modulating wave – the phase function, in this case – isn't necessarily a sine wave and that it must have the same frequency as the carrier.